March 29, 2011 - Eurocopter Holding, a subsidiary of EADS and Vector Aerospace Corporation a Canadian company, have entered into a Support Agreement. Pursuant to which Eurocopter Holding will acquire all of the issued and outstanding common shares of Vector Aerospace by way of a take-over bid for consideration of C$13 in cash per Common Share (the Offer). Vector Aerospace, a leading provider of multi-platform helicopter maintenance, repair and overhaul (MRO) services and of rotary and fixed-wing aircraft engine repair & overhaul, will become Eurocopter Holding?s independent multi-platform MRO services provider. Vector Aerospace, which employs some 2,500 persons, is principally located in Canada and the United Kingdom, and enjoys an important presence in the United States and South Africa. Vector Aerospace will maintain and develop its world-renowned brand name. In 2010, Vector Aerospace generated a turnover of 545 million Canadian dollars (400 million euros) ? roughly the equivalent of a quarter of Eurocopter?s current Support and Services turnover (1.7 billion euros). The acquisition of Vector Aerospace constitutes a key step towards the achievement of EADS? strategic goals, Vision 2020. This acquisition is a catalyst for the growth of Support & Services with a focus on the high end segment and the servicing of multi-customer platforms both in the civil and governmental markets. Vector Aerospace will also strengthen EADS? presence in North America, improving the natural $ hedge. The robust and proven operational and financial performance of Vector Aerospace will support EADS? EBIT targets. Already present in the small engine MRO segment through its SECA holding, EADS will be able to improve its commercial and geographical coverage as well as enhance its service offering in that field. Completion of the transaction will enable Eurocopter to capitalize on its own commercial network together with Vector Aerospace?s offering in order to position itself as a leading global multi-platform service provider with an extended presence in North America and the UK. Vector Aerospace will benefit from Eurocopter?s global footprint and presence in 25 countries to develop in fast growing markets such as Asia and Latin America. Louis Gallois, CEO of EADS, stated: ?This acquisition perfectly fits EADS? Vision 2020 strategy, increasing services, strengthening the helicopter business, international and more specifically North American exposure while keeping a good balance between military and civil activities. It is also an excellent investment opportunity for Eurocopter, as Vector Aerospace has proven resilient and profitable growth. EADS sees in this acquisition a potential for synergies and value creation for our shareholders.? The acquisition of Vector Aerospace is a major step towards expanding Eurocopter?s Support and Services footprint into new areas, such as the maintenance of engines and non-Eurocopter products. According to Lutz Bertling, CEO of Eurocopter Holding, ?This opportunity will provide the Eurocopter group with a high-level of expertise, especially in public-private partnerships for the maintenance on governmental aircraft. The complementary nature of our worldwide network of subsidiaries and Vector Aerospace?s own network will enable us to develop our activities jointly, both faster and more efficiently. Vector Aerospace will be managed as an independent multi-customer platform MRO.? 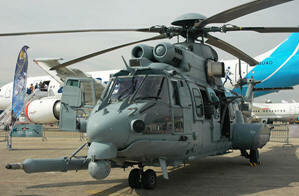 Declan O?Shea, CEO of Vector Aerospace, stated: ?We are delighted to join EADS and Eurocopter. We believe that being part of the Eurocopter group will allow Vector Aerospace and our people to pursue our long history of profitable growth and excellent levels of quality and customer service. Vector Aerospace?s business will be complementary to Eurocopter?s services activities, in serving multi-customer platforms.? Completion of the Offer is subject to usual and customary conditions including, but not limited to, a minimum of 66?% of the Common Shares of Vector Aerospace being tendered to the Offer, as well as the obtaining of regulatory approvals. A take-over bid circular in connection with the Offer will be mailed to Vector Aerospace shareholders shortly. Under the Support Agreement, Vector Aerospace has agreed that it will not solicit or initiate any discussions concerning the pursuit of any other acquisition proposals. Vector Aerospace has also agreed to pay a termination fee of C$12.5 million to Eurocopter in certain circumstances. In addition, Eurocopter has the right to match any competing superior proposal for Vector Aerospace in the event any such proposal is made.